My house has been lovelorn this February. Two of my lodgers plus Giant Boy, despite filling up on protein shakes with names like Napalm and BlokeStuff and working out with dumbbells, have had their marching orders from their girlfriends. It is not enough to be hench it seems, it is not enough to be mean and moody and aiming for fabulous abs. Something for their girlfriends was missing, and the boys were dismissed one after the other. Being tough and able to lift heavy weights didn't work when it came to emotions. My heart went out to these youngsters, as first one got his marching orders from the girlfriend's new boyfriend (drama), then another got a goodbye text (painful) and the third was summonsed to hear the goodbyes personally (traumatic). There were sad, unhappy tears and I sat on my hands so as not to do any creepy stuff like hugging. Everyone cries, I said, it's what we humans do when we are sad. They tried to say that no, it was fine and they weren't crying, but they were. It was quite a month, for breakups. By the third breakup, the other two lads were able to help and within a few days, all three were out on the town. It is a measure of youth, that they were able to delete their girlfriends from Facebook, pat each other on the back, buy a bottle of Vodka and move swiftly on. And so, tonight, Giant Boy is out with friends, and the other two lodgers are wearing new hair mousse and are deciding that being footloose and fancy free is not so very bad. However, I know that in the more sober and still moments, all those girlfriends are missed terribly. And in a wonderfully ironic contrast, March began with Fancy Girl getting married. Fancy Girl and her new husband Tiny Mike (who is very very tall and big) just married. Fancy Girl is about 6'1" here and Tiny Mike is about 6'4". 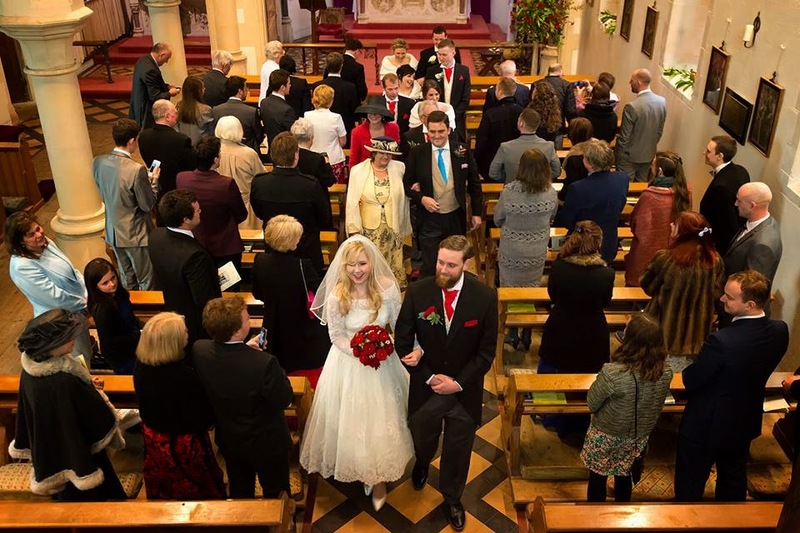 On the 1 March, the very first day of the month, my darling daughter married the man of her dreams. Tiny Mike is a gentle, kind, sweet, funny and strong minded fellow. Yes, it was the most perfect wedding, and oh the dress was beautiful. Oh the bride was - is - beautiful! My part in the wedding was to say Yes all the time to everything. It was a good thing to do, and it enabled things to get done and it stopped any difficulties (my end) from developing. Can I collect Eileen Rafferty, photographer extraordinaire and Fancy Girl's Godmother from Heathrow at 5.45am on Friday? Yes! Can all the bridesmaids come and stay forever and can we make all the bunting, road signs, plans, bits, pieces and will you do the order of service? Yes! And can we eat a lot? Yes! Can you go back and forth collecting and delivering over long distances? Yes! After the wedding on Sunday can lots of people come and stay here? Yes! And will you feed them? Yes! 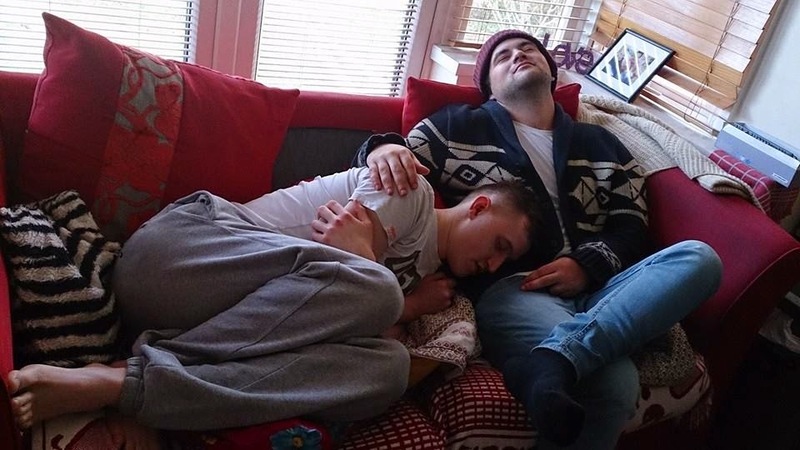 The morning after and Giant Boy cuddling up to Cousin Will who is by far the more seasoned party goer. Will here put himself in the recovery position under the piano for the rest of the day. The man is an artist. I put all things on hold for the last week of February, and had the pleasure of Fancy Girl coming to stay here with me on her own to get the final things done. A special time with my most beautiful and amazing daughter, who had worked so hard to get the wedding as she wanted it. Tiny Mike, clever fellow, was very unconcerned, all he wanted was to get married and have no fuss. Up to you, my dear, he said. It was a lovely time, having her to stay; the end of an era. I remember Fancy Girl being a tiny wee thing, in love with all the Disney Princesses. From an early age she wanted to wear marry dresses, and thanks to her doting father, while he was around, she had them. She liked to sleep with me at nights too, and so from the word go, for a treat, she would get into mummy's bed and sleep next to me, with her chubby little arms flung across my face. She loved tea in pretty cups, and jam sandwiches cut up into tiny squares on a pretty plate, and at all times she knew exactly what she wanted. For this final week before the wedding, she slept next to me again, and we had breakfasts together in bed on pretty trays in the morning. We spent time in the studio making lists of things, and creating, making and organising. My little girl would be changing her name on Sunday, and in the best possible way, leaving me behind. So our week together has been what memories are made of. I will have that week for ever in my mind, before she changed into the most beautiful of all the Disney Princesses, and married a good and honest Prince. Now, as Mrs Fancy Girl, she has taken on a new life, and is where she always wanted to be. And so. Eileen is back from Tanzania and staying with me for a couple of weeks. She has come home to be the wedding photographer, and it is just lovely to have her here. Slowly, this week, I have been tidying and cleaning my house and studio. With two weeks off, one week before the wedding and one week after to recover and reclaim my house, I have forgotten what it is to work. Part of this week's tidying and repossessing my house was to enable me to list again all the projects and painting work that I have to do. By Thursday I had remembered what I was doing and by Friday I had earned the right to buy a packet of chocolate hob nobs and eat the lot in one sitting. That was my reward. Eileen made me buy two packets so I could share one with visiting friends and have the second all for myself without complications. Eileen thinks ahead, she knows her stuff. You are all welcome to come along. It helps to bring hob nobs. It will make me love you even more. 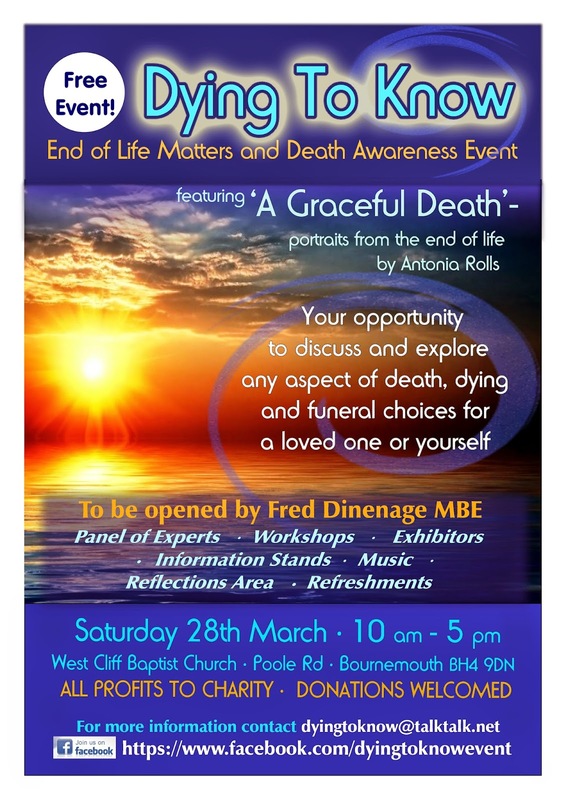 Saturday 28 March the Dying to Know event in Bournemouth. A Graceful Death will be there and Fr Dominic's portrait will be shown publicly for the first time. Dying to Know is organised by my dear soul midwife friend and colleague Mandy Preece and her team. Friday 20 March the Conversations at the End of Life, Finding Time to Think in our Busy World will be held in St Paul's Arts Centre from 2pm to 4pm. Gill and I will host this with our usual tea and cake and gentle guided conversation about ANY aspect of death and dying that you want to address. Saturday 14 March "Spirit of Living and Dying" workshop at the Hamblin Trust in Bosham, Chichester - this workshop will also be held at Angelica's Health and Wellbeing, at the Windmill in Barnham on 12 April. 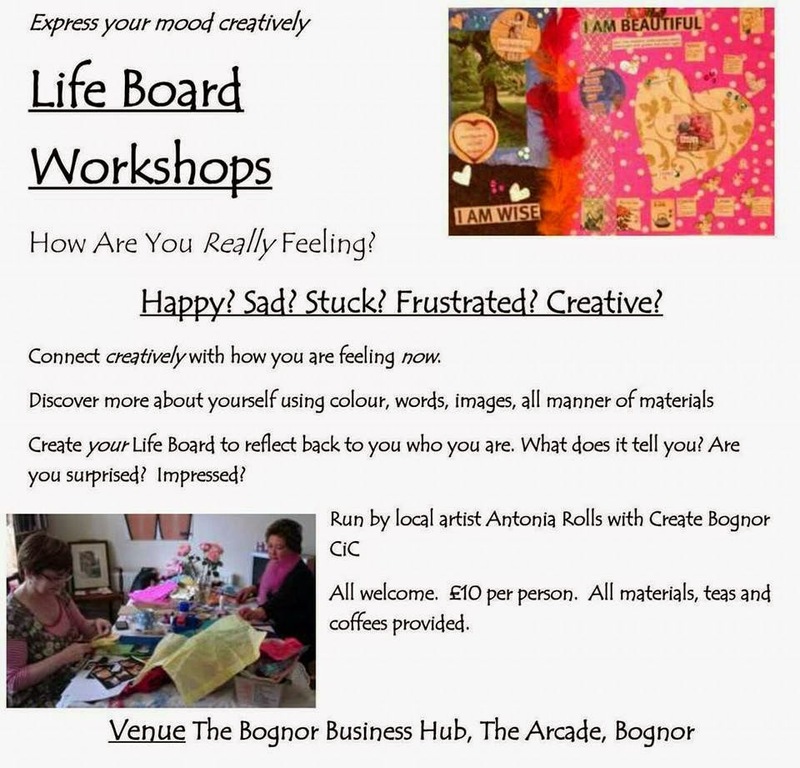 Life Board workshops at the Bognor Business Hub every Monday in association with Create Bognor CiC - all are welcome. Much chatting, expressing and creating. See what it tells you about yourself. This workshop is a gentle and insightful way of seeing how you are feeling. Good too for the sheer fun of creating and expressing, and there is, as ever, cake. Hob nobs. The sun has been shining these last few days, and everyone in Bognor put on teeshirts and shorts. It is as if sunlight equals temperature raise, and despite the cold, there were happy faces in the town. I was one of the happy faces, with my hat and coat still on. Spring is coming, and the days are getting longer. Giant Boy and I have decided to cycle to the swimming pool on our bikes, swim, and cycle home again, but we can't quite find corresponding times in our schedules to do it, and so it remains a jolly good idea that we will do at some point, almost certainly perhaps. The light is brighter, and I can see in the studio much better. I have talks and workshops and presentations to prepare over the next few months, and because the days are longer, and there are daffodils and cyclamen in my garden, I think it will all be fine, all be perfectly alright, and even if I speak rubbish, everyone will be nice about it. I spoke at International Womens' Day yesterday in Bognor. I spoke about soul midwifery to end the day long event, and had the pleasure of addressing some very interesting ladies. The talk is not always easy to listen to if you are nervous about the end of life, or you are bereaved. But the subject of end of life is so important to address - and the point of telling you this is that the talk that I had prepared was not the one I actually did, I found myself doing something completely different and surprising myself considerably. I don't think I said anything controversial, I don't think I said anything that wasn't accurate, but I did surprise myself and probably everyone else there too. But the point is, everyone was very nice! Was that because the sun is shining and there are daffodils and cyclamen in my garden? 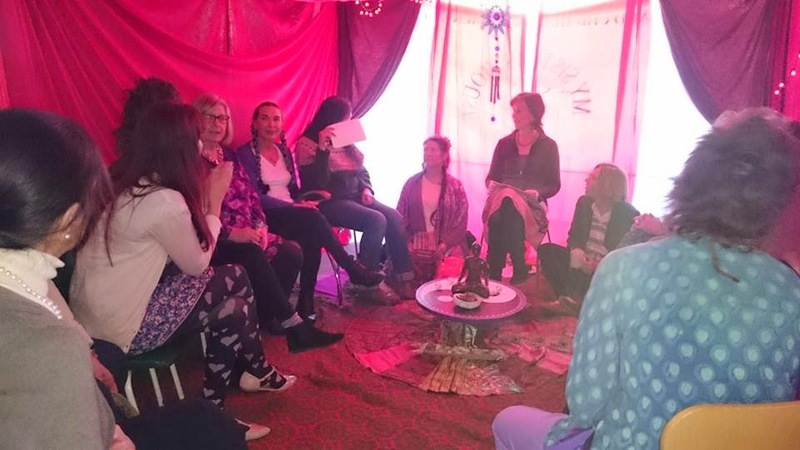 The soul midwife talk for International Womens' Day yesterday. Do you think anyone looks surprised? Do you think I look surprised? Enjoy the brightness of the light this March, and have a lovely month. I hope my household is full of love again by April and that Giant Boy and I do manage to do some cycling and swimming. Maybe definitely. Perhaps.